Karen Tang, ‘Synapsid’ 2014. Sculpture at Bermondsey Square. Image courtesy of Vitrine and L'étrangère. Photographer Jonathan Bassett. Every year, the Square Mile gets filled with brilliant sculptures. This year, it features works by Damien Hirst and Daniel Buren, but they’re a bit meh. Here’s our pick of the really good ones. Sculpture, schmulpture! Who needs to sculpt a bust of some famous old racist when you could just fill a tree with plastic bags? Among all the pristine, clean, neat streets of the City – and the big, showy, ostentation public art dotted around the place – Creed’s rubbish tree is the perfect FU. 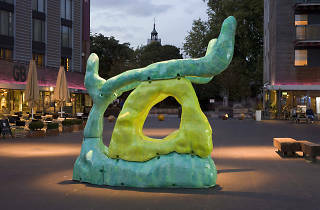 It’s meant to undermine its surroundings and its medium; it’s silly, humorous, knowing, mocking and totally brilliant. This is exactly what the City of London needs: a bit of grotty weird filth stinking up the place. Paul McCarthy is one of the nastier American artists of his generation, and here he’s taken two German kids’ toys, blown them up to massive proportions and melted them into goopy, ghost-like blobs of creepy weirdness. They’re unsettling, aggressive and totally incongruous in the space. In other words, perfect. Anyone can make a sculpture out of something beautiful, but it takes real cojones to make one out of a bloody shed. 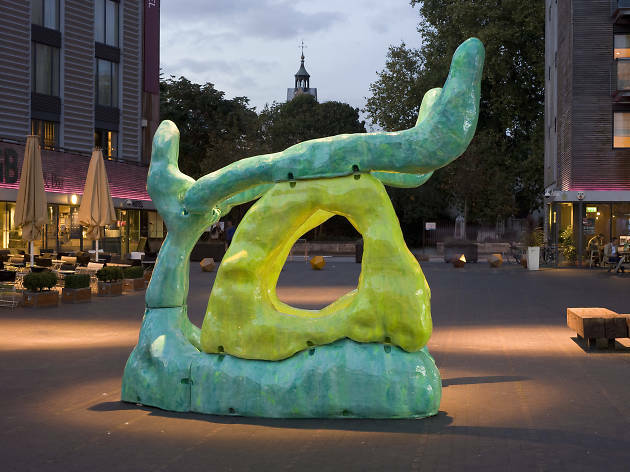 Rackowe is following in the footsteps of fellow shed-art pioneers Cornelia Parker and Simon Starling with this upended neon dad-cave. It looks like something sinister is going on down the bottom of the garden – ‘X Files’ meets ‘DIY SOS’. Big fan of these three cocoon-like protrusions on the amazing Lloyds Building: they make it look like the structure is diseased, a fungal growth ravaging its walls and struts, turning the cold brutal architecture into a living, breathing, alien thing. The one hung by itself works the best, because when you crane your neck up at the two together they look like a bit like the building’s got testes. Find more great art right here.